Grahamstown is being draped in red, white and blue as it prepares to welcome thousands of visitors to this year’s National Arts Festival, which runs from June 29 to July 9. This is the 43rd instalment of the annual event, billed as Africa’s biggest and boldest celebration of the arts. Showcasing more than 700 shows, the programme features theatre, dance, music, visual and performance arts, film, illusion, cabaret and more. This year’s comedy is particularly strong, with the biggest names in South African comedy performing alongside visiting talents such as UK comedians Stephen K Amos and Louise Reay. Jazz will be celebrated with a sensational programme of South African greats – including Judith Sephuma, Afrika Mkhize and Zenzi Makeba Lee, Kyle Shephard, and Benjamin Jephta –collaborating with international legends such as Andy Narell (USA) and the James Morrison Quartet (Australia) for the 20th anniversary edition of the Standard Bank Jazz Festival. Families will be happily entertained with a full programme of fun that includes children: Festival favourites include Rat Race, James And The Giant Peach and Granny Susan Incredible. 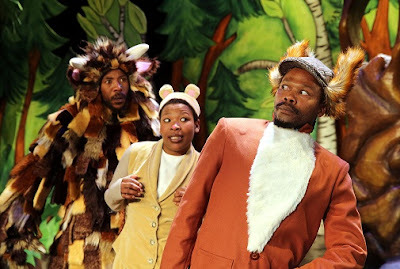 After successful runs in Cape Town and Johannesburg, Grahamstown’s production of The Gruffalo is set to run for the full 11 days of the Festival. Free performances of When Lion Had Wings and other child-friendly activities are events to look forward to. Parents can enrol their children (ages 4-13) into the Children’s Arts Festival, hosted by St Andrew’s Prep school. Think!Fest, a series of lectures, workshops and seminars, will include a spotlight on children to mark the 100th anniversary of Child Welfare in Grahamstown. The daily programme draws in a mix of high emotion and cerebral ruminations with speakers and audiences unpacking topical issues such as fake news (with Verashni Pillay), climate change, the “lost art of listening”, land acquisition and redistribution as well as focus on collaboration and growing the arts industry. In a jam-packed programme, there’s something to meet every interest, including the launch of the latest Short, Sharp Stories collection Trade Secrets. Research* commissioned by the National Arts Festival and South African Cultural Observatory revealed that the global attendance (the number of times performances and exhibitions were seen) at the 2016 National Arts Festival was 225,634 and that the average number of shows seen by a visitor was 10 (over and above free performances). Visitors stayed at the Festival for an average of six days.